California-based chip designer Marvell Technology Group is planning to buy its competitor Cavium for $6 billion. The deal has been unanimously approved by the boards of directors of both companies and could create a technology giant with $3.4 billion in annual revenue, operating across hyperscale data center, enterprise IT and service provider markets. Among other things, Cavium is responsible for ThunderX and ThunderX2 – some of the most successful Arm-based server chips released to date. Marvell started out in 1995 by designing storage controllers but today it is primarily known for its networking chips, especially those for wireless networking. Cavium designs chips for a wide variety of IT hardware, from low-power silicon for connectivity and security equipment to fully-featured server SoCs based on Arm architecture. 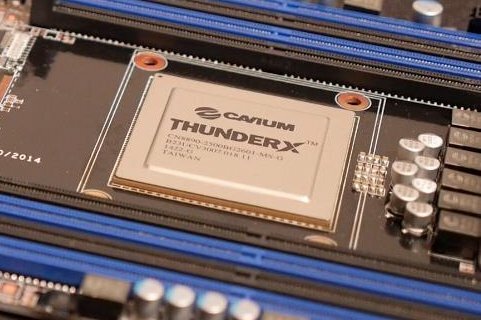 The company participates in industry initiatives like the Open Compute Project and so far, its recently launched ThunderX2 is the only Arm-based chip to make it into Microsoft’s Project Olympus server designs. Both Marvell and Cavium are fabless silicon vendors – they specialize in chip blueprints, and outsource manufacturing operations to original design manufacturers (ODMs). “Individually, our businesses are exceptionally strong, but together, we will be one of the few companies in the world capable of delivering such a comprehensive set of end-to-end solutions to our combined customer base,” Cavium co-founder and CEO Syed Ali said. Under the terms of the deal Marvell will offer $40.00 per share in cash and 2.1757 of its shares for each Cavium share. The company said that the combined portfolio of products will expand Marvell’s addressable market to more than $16 billion. As part of the transition, Ali will join the Marvell board of directors, while Cavium’s co-founder Raghib Hussain and vice president of IC Engineering Anil Jain will gain senior leadership positions in the combined company. The transaction is expected to close in the middle of 2018, subject to regulatory approval as well as other customary closing conditions, including shareholder approval.